If your idea of perfect holidays consist of going on a getaway from mass tourism and large crowds than this route might interest you. 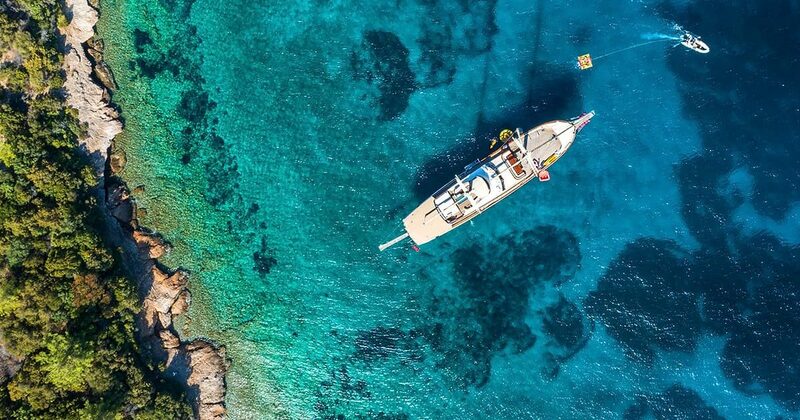 With this route, you will get to see some of the most amazing bays and hidden gems that the Turkish coast has to offer. There will be many opportunities to have fun on the sea and on land as well, with watersports, hiking, paragliding, enjoying on beaches etc. There is something for everyone, no matter if you are watersports enthusiast or family with kids, this route is quite adaptable for almost all need and generations. Your cruise starts in Göcek port, check-in is from 4:00 p.m.
Our representative will welcome you on a yacht, show you around and introduce you with your crew. 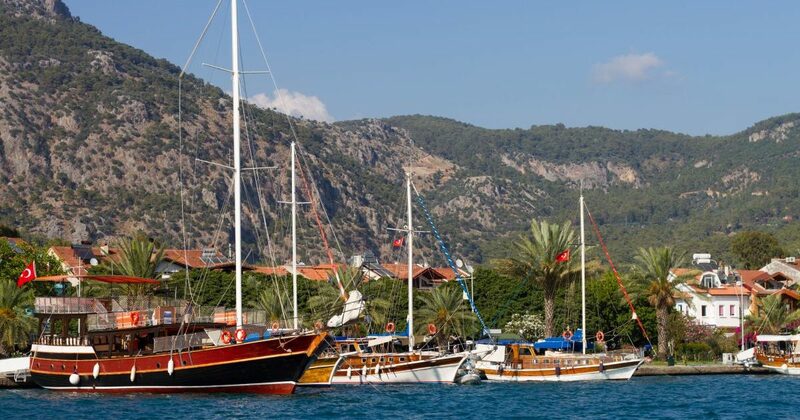 Gocek is the destination of the first day – a natural harbor protected by mountains it has 6 marinas that provide ample anchorage for many yachts and it’s a great starting point for charter. In the city center, you will see a long street Turgut Ozal Street that offers many outlets for antique and modern carpets and textiles, gifts shops, restaurants etc. Or maybe experience something local like shave in a traditional barber with face massage. The first departure will be to Tersane Island where you will stay in the bay area. If you want to walk around a bit there is an ancient ruined town nearby called Telandria. After a quick stop we will head to Gemiler island, an uninhabited island that has few restaurants and cafes however owners only come there to work and leave later in the day. For this reason, the island is considered to be a very relaxing place perfect for overnight stay. Here you can find lots of ancient ruins, remains of churches, Byzantine ruins, and St. Nicholas’ tomb. Ölüdeniz is a small village with name origin that in Turkish stands for the Dead Sea, which derives from the calm waters. This is one of the most visited tourist spots so expect to find lively streets and beaches. Speaking about beaches, Ölüdeniz has the most photographed beach. Here you also have quite opportunity to go paragliding and take off from Babadağ Mountain, 2000 m and fly over ÖlüDeniz beach and Blue Lagoon. However, we suggest looking into pre-booking this activity. For others, this is a great place also for watersports, snorkeling and scuba diving and on land, you’ll find restaurants and cafes for lunch. Butterfly Valley is only really accessible by sea and this will be your second destination of the day you’ll head to in the afternoon. The name originally came from the amazing natural wonder that happens only during the summer, and only for a few weeks when valley fills with butterflies and looks like a fairytale. You’ll stay here overnight in a peaceful atmosphere. Small village under the surrounding mountains called Yeşilköy is the new destination you’ll visit after a delicious breakfast. This is the place where you’ll feel relaxed and calm in the small farming community. After a shortstop, your Captain will sail to Kas once a small fishing village, today it is a growing tourist town. The yacht will anchor in the elegant marina where you’ll find perfect conditions for scuba diving. The town has great connections connected by modern roads and is also a great base for exploring the archeological sites and regional history. For those who want to explore the land, quite close to the harbor you’ll find ancient amphitheater, and close to that there are plenty of small restaurants where you can try out local food. While your crew is stocking up, you can either relax in town or go swimming or scuba diving. 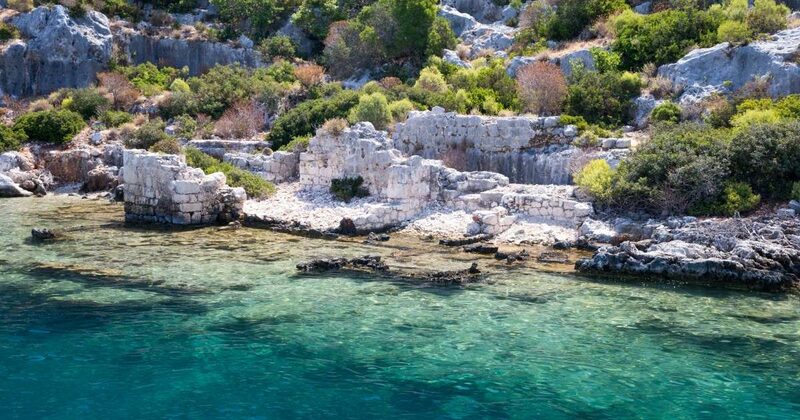 Near Kas, there is Theimussa bay located near the sunken city off the island of Kekova and you can see the historic castle that starts on a hill and ends under the sea. There you can enjoy in lovely breakfast and take a swim in the refreshing sea before next departure to Kekova. 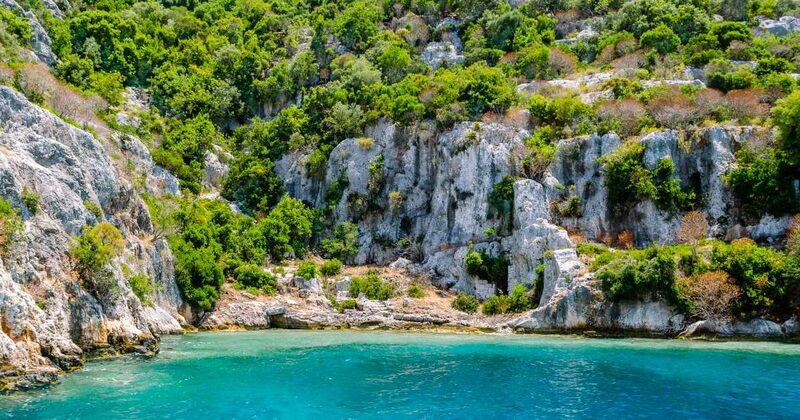 The Kekova island is a protected, unspoiled and uninhabited region perfect for getaways where you can relax on board or on land away from mass tourism and large crowds. You will anchor and be able to visit the area to enjoy the breathtaking views, clear turquoise seas and historic ruins dating back to thousands of years. Along the northern coast of Kekova lies the ancient sunken city of Apollonia and old summer houses and seaside homes. On this day you will arrive first to Turunç Pınarı who is home to lovely restaurant surrounded by pine trees. The restaurant offers 15 moorings which can be very convenient. After breakfast, you can go on a small hike up the hillside where you’ll find a natural water spring. If you prefer to stay on board you can enjoy in watersports provided on a yacht or simply relax, read a favorite book and catch some sun. After lunch Captain will departure to Kizil island which is considered to be a magical place at sunset. In the sunset interestingly the whole island transforms, when magically stones turn crimson red, which is an unforgettable spectacle that you should definitely capture with your camera. Yasica islands are uninhabited islands that are perfect for swimming, sailing around and forgetting about stressful everyday life in most romantic places. The islands are covered with pine and olive trees and have many well sheltered and shallow bays. There is also a sandy beach and a small lagoon where families with children can come to play. Most of these islands have secluded beaches that provide a private relaxation environment. Apart from relaxing, you can stay active with water sports, even for kids that definitely won’t be bored. Later on, you will head to Bedri Rahmi Bay named after the famous Turkish author Bedri Rahmi Eyuboglu who used to come fishing in the bay. During one of his fishing trips in 1973, he drew a fish on a rock at the entrance of the bay, giving the rock a new title “Fish Rock”. Due to the fact this is very well sheltered bay, it makes it a great place for overnight stay with oleander smell in the air. 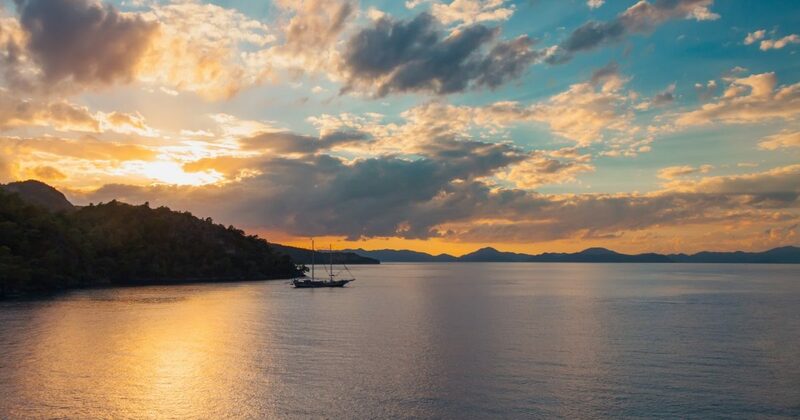 You arrive at Gocek at the end of your voyage where your cruise, unfortunately, comes to the end. Check-out is till 10:00 a.m. – after breakfast. If you haven’t visited the city center on the first day, we strongly suggest to do it before leaving. Before you, a check-out representative will give you one last visit on board to check how everything went and if you need any further assistance (transfers, suggestions on how to spend the day till your flight and similar).